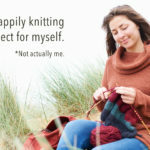 If you’re starting to ponder over holiday knitting season you’re not alone: the time to scour the internet for holiday knitting patterns is here and Interweave Knits Gifts 2018 is your shortcut to hours of seemingly endless scrolling! It features 21 small, quick knitting projects to delight anyone on your list and four of the most precious critters to ever exist. Seriously, how cute are these little guys? Brenda K. B. Anderson is a toy-design master and it comes as no surprise that she designs costumes for Sesame Street Live! Her creations have so much personality and charm, what really stands out is her mastery of eyes. She pulls so many emotions out of a set of buttons and some felt—it seems like magic but you can learn her secrets! 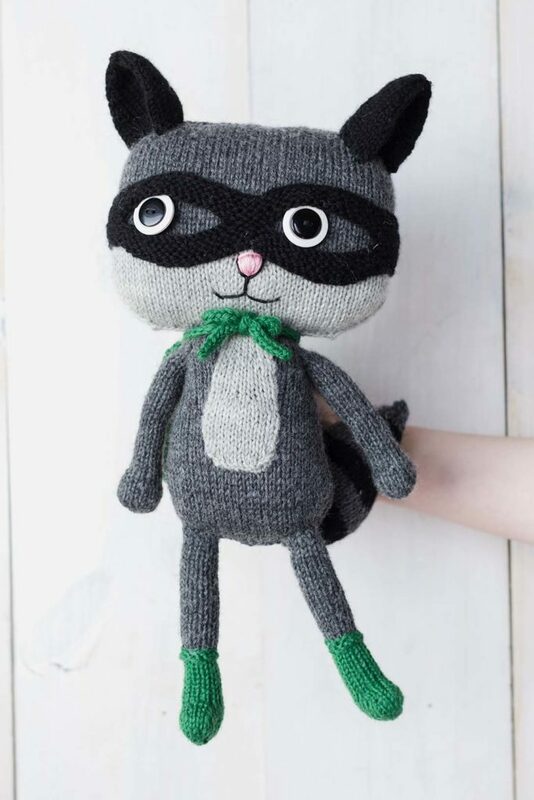 Now let’s got down to business: here are the toys in Interweave Knits Gift’s 2018. 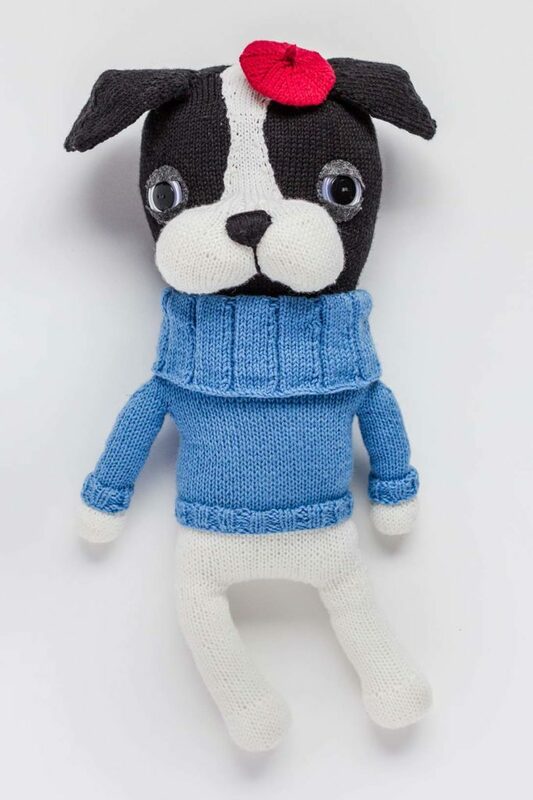 Belvedere the French Bulldog is a fancy Parisian gent sporting a jaunty beret and a handsome handknit sweater. Sleepy, judgmental, or happy, this little French bulldog has the potential for a variety of expressions and personalities depending on how you place his eyelids. FINISHED SIZE 21″ head circumference and 20″ tall, excluding ears. YARN Cascade Yarns 220 Superwash (100% superwash wool; 220 yd [200 m]/3½ oz [100 g]): #815 black (MC); #884 skyline blue (A); #871 white (B), and #809 really red (C), 1 ball each. NEEDLES Size 4 (3.5 mm): 16″ circular (cir) and set of double-pointed (dpn). Adjust needle size if necessary to obtain the correct gauge. NOTIONS Markers (m); stitch holders; tapestry needle; polyester fiberfill; quilter’s pins; dark gray pre-stiffened felt; dark gray thread and sewing needle; two 1 3/8″ (35 mm) two-hole white buttons; two 7/8″ (22 mm) two-hole black buttons. GAUGE 21 sts and 28 rnds = 4″ in St st.
Raccoons are a mysterious lot—they’re never seen without a mask, and just what are they doing in the shadows in the middle of the night? Trash Panda is so dang cute we’re giving him the benefit of the doubt, but he sure is dressed for mischief. Although wearing a mask doesn’t always mean you are up to no good. Is he a hero or mischief-maker? You decide. 3″ deep (from nose to back of head). [100 m]/1¾ oz [50 g]): #26304 cobblestone heather (dark grey; MC), 2 balls; #26302 dove heather (light grey; A), #26323 coal (B), and #26328 grass (C), 1 ball each. NEEDLES Size 3 (3.25 mm): 16″ circular (cir) and set of double-pointed (dpn). Size 7 (4.5 mm): straight (for cape only). Adjust needle size if necessary to obtain the correct gauge. 1 1/8″ buttons and two black ¾” buttons (Note: Buttons should be flat, with no shank, and have the same number of holes so that they can be stitched together when stacked); sewing needle and black thread; pink and black embroidery floss and embroidery needle for nose/mouth. GAUGE 20 sts and 29 rnds = 4″ in St st on smaller needle. 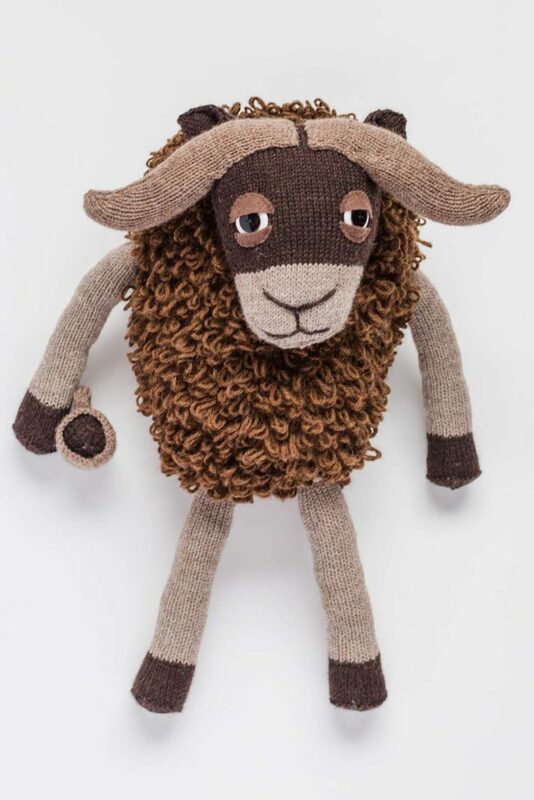 Murray the Musk Ox isn’t a morning ox—magnets inside his hoof and mug ensure his hot chocolate is nearby at all times. 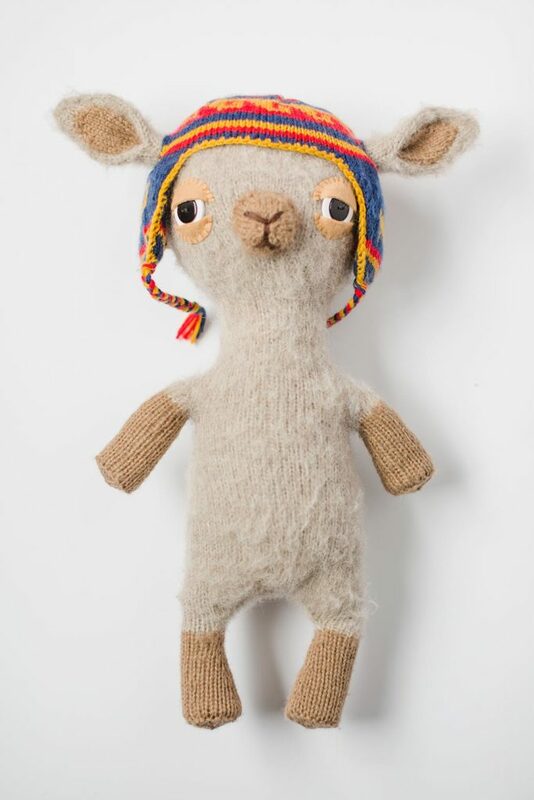 Murray’s furry body is worked in loop stitch to give him snuggly texture. This stitch does take extra effort, but it’s fun, unusual, and well worth learning. Don’t forget to add his sleepy eyes to remind you that it’s always a good time for a nap with a stuffed friend. FINISHED SIZE 9½” wide (measured across widest point at upper body) and 21″ tall (including his 8″ long legs). YARN Plymouth Yarn Galway Worsted (100% wool; 210 yd [192 m]/3½ oz [100 g]): #759 Reese cup (medium brown; MC), 3 balls; #757 bark heather (dark brown; A), #752 pebble beach heather (light taupe; B), and #711 pale brown heather (light brown, C), 1 ball each. NEEDLES Size 6 (4 mm): straight. Size 4 (3.5 mm): set of double-pointed (dpn). Adjust needle size if necessary to obtain the correct gauge. NOTIONS Markers (m); removable m; tapestry needle; quilter’s pins; polyester fiberfill; size E/4 (3.5 mm) crochet hook; one 9″ × 12″ sheet of black (or brown) “-thick craft foam; two white 1 ” buttons and two black ” buttons (Note: Buttons should be flat, with no shank, and have the same number of holes so that they can be stitched together when stacked); sewing needle and black thread; small amount of brown felt and matching thread for eyelids and magnet casing; optional: small amount of instant glue to keep lower lids in place; 2 super strong magnets to fasten hot chocolate to Murray’s hoof (see Notes). GAUGE 13 sts and 21 rows = 4″ in Loop st patt with yarn held double on larger needles; 26 sts and 29 rnds = 4″ in St st with 1 strand of yarn on smaller needles. 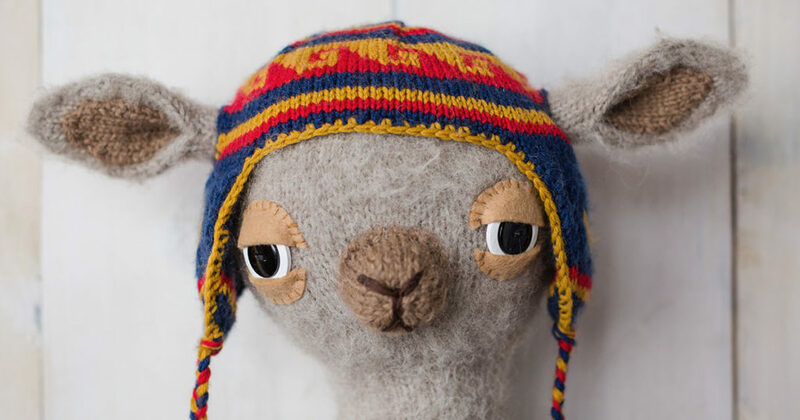 Liam the Llama’s laid-back vibe, oversized head, and Peruvian-inspired hat give him the appearance of a hacky sack champion en route to a Grateful Dead concert. Although his head appears too large for his tiny body, his neck is sufficiently stuffed to hold his head proud and high. Brush the finished piece with a wire slicker brush to create the fuzzy “llama-ness” of his fleece. FINISHED SIZE 18½” head circumference and 17½” tall. [193 m]/3½ oz [100 g]): #1001 boho beige (MC) and #1002 serenity sand (CC), 1 ball each. NOTIONS Markers (m); removable m; stitch holders; tapestry needle; polyester fiberfill; one 9″ × 12″ sheet of black (or brown) “-thick craft foam; two white 1 ” buttons and two black ” buttons (Note: Buttons should be flat, with no shank, and have the same number of holes so that they can be stitched together when stacked); sewing needle and black thread; small amount of beige felt and matching thread for eyelids; small amount of instant glue to keep lower lids in place (optional); 1 skein of dark brown embroidery floss and embroidery needle for nose/mouth; wire slicker brush (see Notes). GAUGE 24 sts and 31 rnds = 4″ in St st. FINISHED SIZE 17″ circumference and 5½” tall (excluding earflaps). 10% cashmere; 153 yd [140 m]/1¾ oz [50 g]): #5008 indigo (A), #5009 sunglow (B), and #5004 crimson (C), 1 ball each. NEEDLES Size 3 (3.25 mm): 16″ circular (cir) and set of double-pointed (dpn). Adjust needle size if necessary to obtain the correct gauge. NOTIONS Markers (m); stitch holders; tapestry needle; size E/4 (3.5 mm) crochet hook. GAUGE 23 sts and 34 rnds = 4″ in St st. There you have it, four unforgettable animals that make this year’s Interweave Knits Gift’s issue extra special. Don’t forget to check out the rest of this incredible issue where you’ll find quick knits, fast cables, and glorious colorwork that will suit all of your holiday knitting goals. Don’t let holiday knitting sneak up on you this year: select your projects early!